Why do they make a big difference? 2ºC (or 3.6º Fahrenheit) is one of the most common figures in climate change debates, but why is just 2º so important? Despite in a human scale 2º degrees don’t make a big difference, for the global climate they represent a threshold that we mustn’t cross if we want to preserve the conditions that make life comfortable on Earth. It is not a random number. Humanity has achieved its biggest goals (from building Pyramids to reaching the moon) during a period of relatively good conditions that allowed the development of humans. However, things began to change since we developed the steam machine and the industrial revolution took place. Since that moment we have burned millions tons of wood, coal, petrol and gas to make our life better but at the same time we poisoned the atmosphere with more and more CO2, the most important greenhouse gas, and we have already warmed the planet almost one degree. If we don’t change this patter and we cross the 2º degrees line, we will unchain serious transformations on the global climate, such as the rise on the number of extreme wheather events, changes in precipitation patterns, melting of the ice sheets on the poles and the resulting rise in the sea level and mass population movements, as the IPCC reports have shown. This global scientific body also warns that if the worst scenario took place, even access to food and drinkable water will be in danger. Scientists know that because they have been looking at the evolution of the global temperatures through official records (since they are available) but also by studies of ice trapped in the different ice layers in the Antarctica; also the pattern of tree growth, which depends on atmospheric conditions. 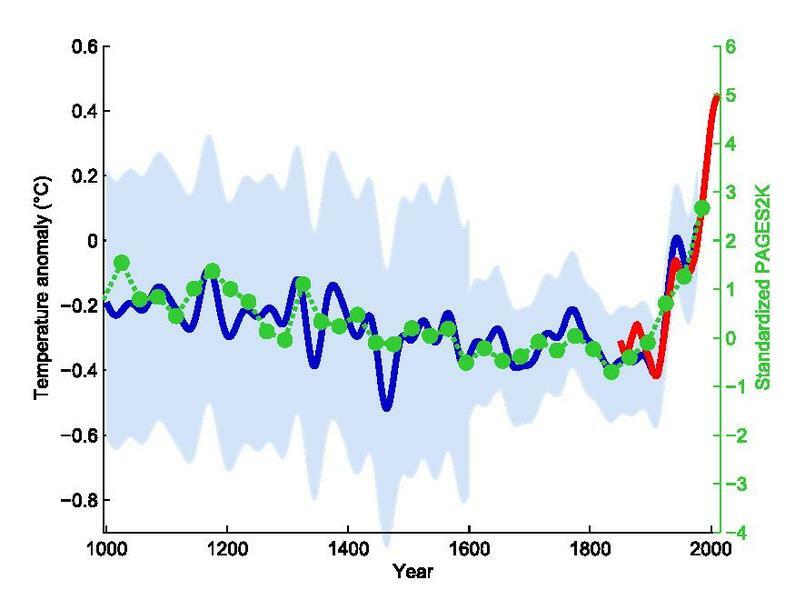 Putting those sources together we’ll see the “Hockey Stick” graphic made famous by Michael E. Mann. This findings also show that to avoid the 2º increase the concentration of CO2 in the atmosphere shouldn’t exceed 350 parts per million (ppm). However, the Mauna Loa laboratory in Hawaii, that has been monitoring the concentration of CO2 since 1958, shows that we have already gone too far and we are near the 400 ppm. Are we still on time to avoid the worst scenario? Yes we are, but we need a serious and committed global action to change the current patterns. And we need it now, because we have no other place to go.